We offer efficient and reliable crawl space repair for home owners in Nebraska needing their crawl space fixed and protected for the safety of their home. A lot of homeowners who have crawl spaces under their home don't give much thought to this area until there's a problem. Moisture here, for example, can cause wooden support beams to warp, rot, and decay. This can jeopardize the structural integrity of your home, and also cause many other serious problems. This water can also lead to the development of mold and bacteria which could make your family really sick. As you can tell, it's important to keep this space dry, and we are here to help. 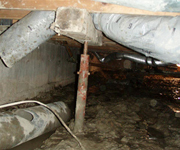 We provide crawl space repair in surrounding areas of Nebraska. 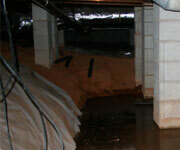 A flooded crawl space isn't very uncommon if you don't have the area sealed off from the outside environment. During a heavy rain, or when you have a lot of melting snow on your lawn, moisture can surge into your crawl space and damage wood, and cause many serious problems. A wet crawl space is inviting to unwanted critters, including: termites, roaches, mosquitoes, snakes, spiders, rats, mice, skunks, and other pests you don't want taking up residence below your home. The rotting wood is attractive to them, and some of them will even live out their entire life cycle here from birth to death. Needless to say, this isn't a good thing, and it can cause major issues for the indoor air quality of your home. All of this moisture is also going to lead to the growth of mold, as mentioned earlier. 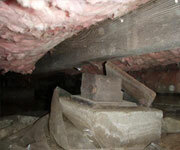 Moisture can also cause your floor joists to buckle, warp, and deteriorate. Over time, they won't be able to support the weight of your home and they will start to floor sagging. You will know that you have this problem if there are certain spots on the first floor of your home that feel like they are no longer level. Mold. It's a term that most people associate with basements, kitchens, or bathrooms. However, it can also grow in a crawl space. 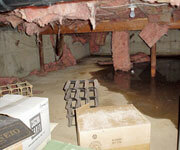 All crawl space mold needs to live is moisture, humidity, and organic materials to feed off of. If these three things are found in your crawl space, then it's only a matter of time before this nasty fungus starts to grow and cause problems. It is usually dark green or black in color, and it can be seen growing on insulation, wooden supports, and floor joists below your home. This mold releases spores up and into the air when it grows, and when your family breathes them in, it can make them really sick!